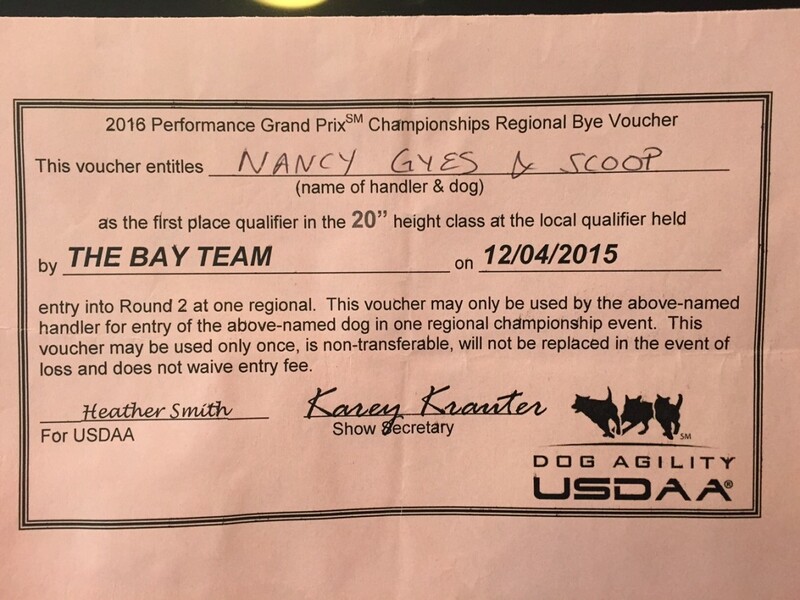 Dennis Sprung, President of the AKC, sent us a big envelope in the mail with a fancy piece of paper that says Scoop earned his novice jumpers title. woohoo! And after last weekend we have 2 open jumpers and 2 open standard legs, and an open FAST leg as well. I was trying to decide which of Scoops videos from the weekend to share with you but got all hung up on the imperfections and couldn’t decide which ones to use. A couple late front crosses from me, a pulled bar and a couple refusals from him, a couple suspect rear crosses that felt just great when I did them but look a little “flickish” on video. Darn! Even with our little goofs though Scoop was a good boy. He is growing in confidence, gaining speed, and he is starting to realize that the leash is sitting on a chair at the gate and that he should head that direction to tug with the leash, rather than jump on me at the end of the run. Through the magic of modern editing I have managed to compile a little video showing some good stuff we did together, and well to be honest, I just cut out the parts I didn’t like:) Wish all of my life’s faults could be “edited” away so easily! Our weaknesses are going to start biting us back once we move to Excellent. I haven’t yet got the independence I need on his contacts and weaves so that I can position myself anywhere I want while he is doing those obstacles. Right now I am not letting him stay long at the end of the DW or teeter because I don’t want him to try to nose touch the board. And I am not asking for extra touches like I do in training. At home this past week he was better, but at the show he was shorter than I want in 2o2o. I don’t have a show for another 3 weeks, and I have a 4 day seminar away from home to teach before then. I am planning on getting in plenty of contact training time while we are in a new location. Hopefully in three weeks I will be feeling more confident on the reliability and independence of those obstacles. For now I am going to stick with AKC for Scoop as I don’t feel confident yet that he can do the higher USDAA frame reliably. Heck, we are not 100% on the low one yet! Oh well, lots to train this week and next week and next month and next year! Hope you had a great weekend showing your young dog, and maybe that you too got a really nice piece of paper in the mail. 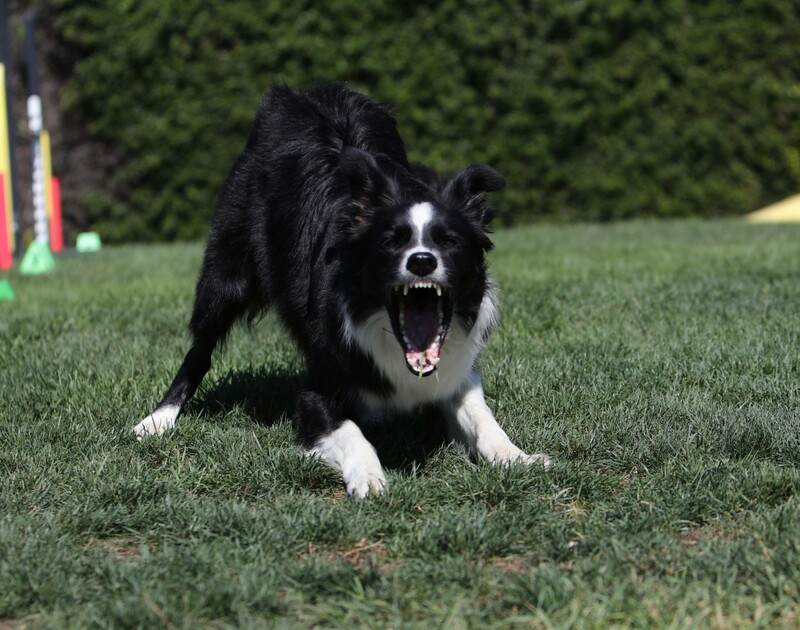 The good news is that Scoop was in his second full AKC trial this past weekend and finished his novice standard title and is now in both Open JWW and Standard. The bad news is that we have not trained all the skills that he is going to encounter in open and excellent. The big ones we are missing are discrimination with contacts/tunnels and different side changes at the A-frame, as well as a bit more independence on the weave exits. Scoop got his first open jumpers leg, here is the video. 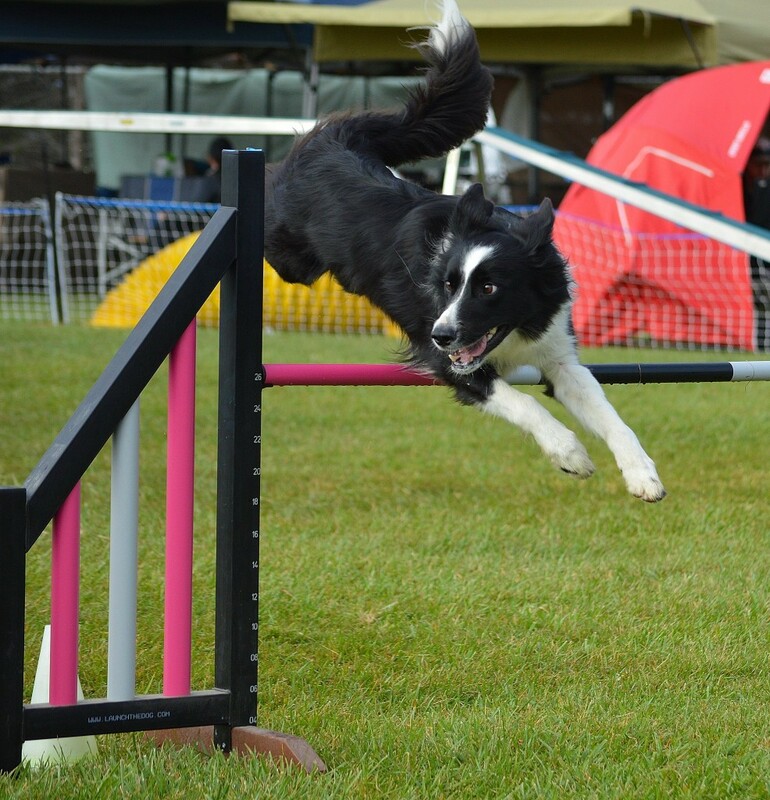 You will see a bit of a bobble when I momentarily lost my way, and almost skipped an obstacle. Scoop did not seem to care, I resent him to the jump and he scooted off nicely and I got back on track. duh:) And we did most of the open standard before the wheels fell off. We got through obstacle 12 smoothly which included a tunnel to DW challenge (by sheer luck since I have never asked him to turn out of a tunnel and go back up a contact). He had a nice DW and good weave entry, lovely table and THEN we had a really most spectacular teeter flyoff. One of those catch your breath in your throat and hope the dog comes down out of the air at some point without any broken bones. 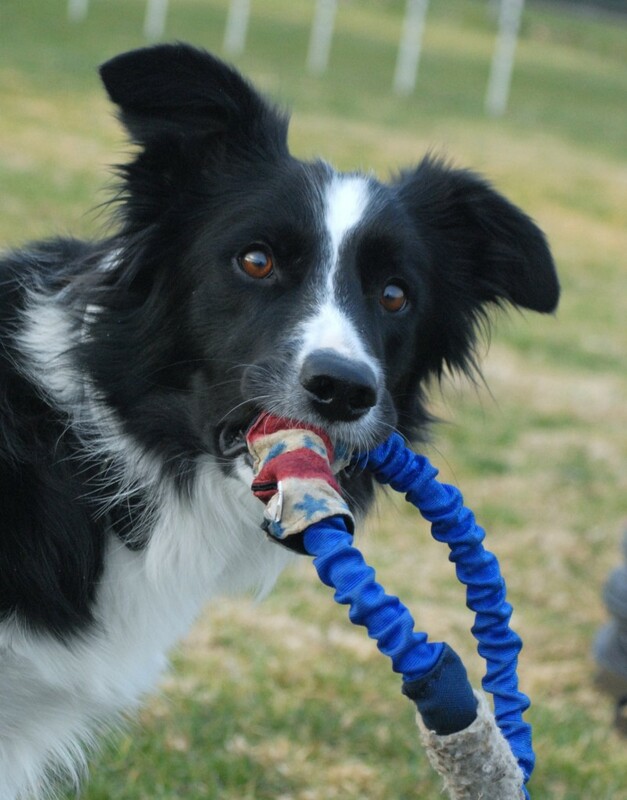 And a skill I really discovered I was missing was what to do on course after an error without a toy to toss or play tug with. Scoop got a bit overstimulated when I had to reset him after a bobble and he considered using me as a tug toy. He stayed at my side when we went to re-enter a set of weaves he had popped at pole 10 when I tried to fade laterally, the problem was how close he was at my side. He was close enough for me to feel his breath on my leg but luckily a word of warning kept him from stepping over the edge. 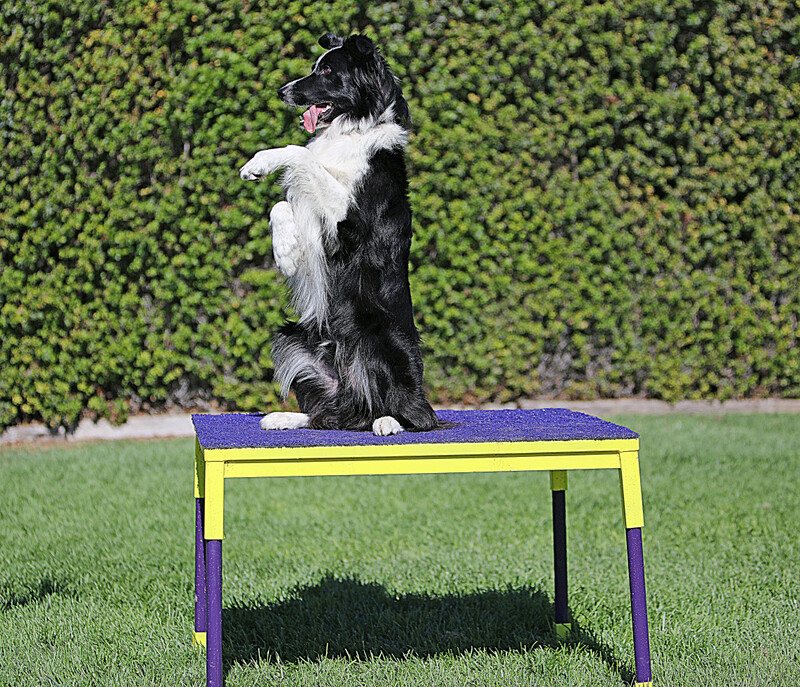 This week we have discrimination on our list of training goals, along with practicing heelwork in the middle of a course without any toy reinforcer in my hand, and continuing Scoop’s frame training with more side changes before and after. And of course, Letter K and hopefully one or two more letters if there is time. 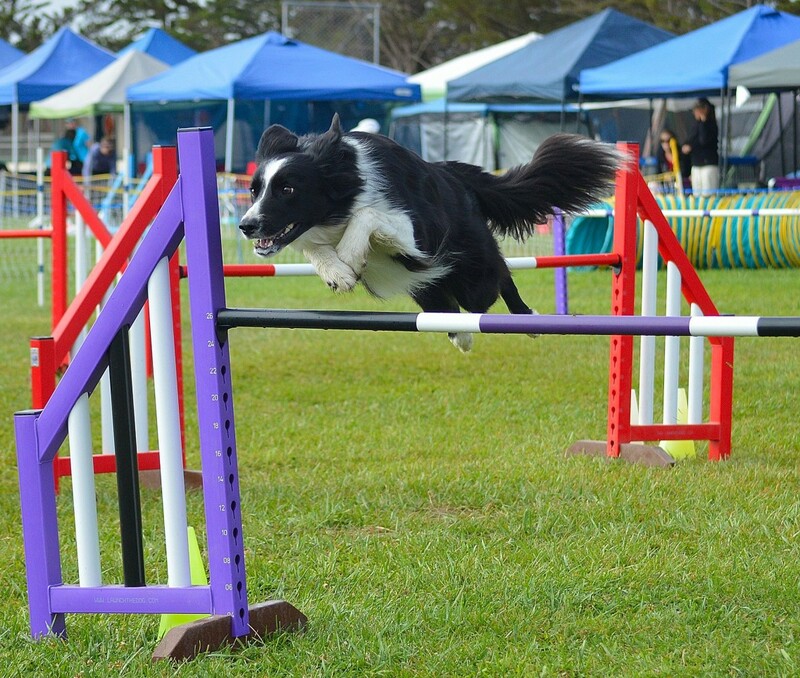 I hope you have a long list of training goals this week with your novice dog too. Life would be so boring if everything was perfect and we didn’t have a training goal for the week/month & year.